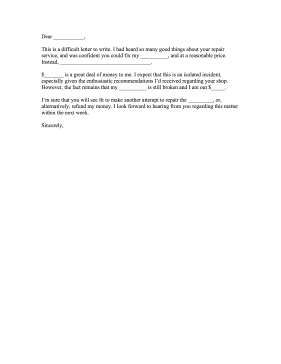 If your item, jewelry, computer, or car was not fixed to your liking, use this repair complaint letter to address the situation. This is a difficult letter to write. I had heard so many good things about your repair service, and was confident you could fix my __________, and at a reasonable price. Instead, _________________________________. $_______ is a great deal of money to me. I expect that this is an isolated incident, especially given the enthusiastic recommendations I'd received regarding your shop. However, the fact remains that my __________ is still broken and I am out $_____. I'm sure that you will see fit to make another attempt to repair the _________, or, alternatively, refund my money. I look forward to hearing from you regarding this matter within the next week.